It's the truth: we cannot change the past. However, the present is ours to meld and do with what we choose. I am a ruminator by nature and thus is so easy, especially when working in solitude at the easel, to drift into "what if" scenarios... to revisit past choices and decisions that seemed wise at the time but in retrospect become overshadowed with doubt. I have to continually, persistently, fight to stay in the moment. My point is that as we all know, the past is finished, the future will never arrive...we only have the present moment. In our helter skelter lifestyle the invariable stresses brought on by technological advancements displace us from the present moment and we are relegated to a state of chronic, elevated stress. I am a caffeine addict and thus my adrenals are probably already burned out. However I take solace knowing that right now...at this very moment, anything is possible. It is a very liberating feeling to realize that each moment is ours to do with as we choose. I am house sitting for a friend of mine and madly biked across town today to get my heart rate up and also to make sure his place was secure. I thought of him hiking out on a glacier in The Yukon Territory and had to fight feelings of envy. I take an iota of comfort in knowing that I will be able to view his pictures upon his return. I also buoy my spirits with the positive thoughts that I too one day will get up to visit the northern areas of North America. The beauty of generous friends with good hearts is that there are often people ready to extend some hospitality and help in the process of exploration. Until then however I am focusing on inward exploration. Setting goals for oneself is healthy I believe. To set goals and not shy away from their seeming unattainability is wise and helps to bring them forth in the world. The latest addition to my list of things to accomplish within the next five years is to write a book. It will be a travel/art book with a focus on paintings of remote locations in Canada with accompanying journals and reflections during and after the sojourns. I am going to travel to two locations on each coast of Canada within the next year. Newfoundland, as I have mentioned previously, is happily crawling closer with each passing day. The rocky crags and warm, generous folks from Newfoundland will surely make for some exciting paintings which I will work on over the next year. 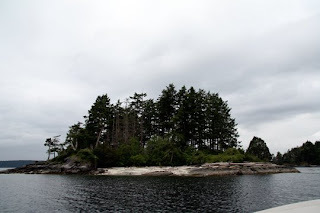 In addition, I am traveling to an isolated little 3 acre island off the coast of Salt Spring Island next spring. There is a small cabin, an outhouse, a lovely copse of trees, a beach and most importantly, no power. I will probably stay on the island for up to two weeks. 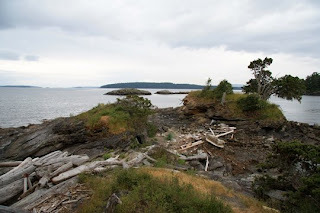 I will sketch, write and collect reference for another body of paintings that will try to capture the overwhelming beauty of that little pocket of British Columbia. 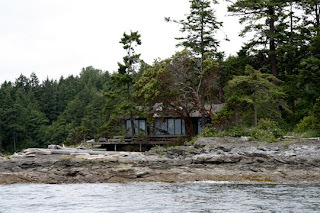 I have included a couple of pictures of the cabin and island. When the large body of paintings are complete and I have compiled my notes I will attempt to get it published. This is all in my mind but it is a goal nonetheless....and I am all about trying my hardest to attain what I set out to do in this life. I wonder if people would find this idea for a book of interest. If so, please send me an email or comment if you are so inclined. An idea has to be viable in order to work. I has to offer something of value to the audience. I hope that my idea will come to fruition and I really believe that with enough energy and effort anything is truly possible. I do not care for tattoos usually. While they can be beautiful I have never been inclined to get one...that is until my final year of university. I adore William Shakespeare and more specifically, his tragedies (no big surprise there). Hamlet is his greatest work I believe and Polonius' words to Laertes have always hit a chord with me: "The above all: to thine own self be true". He speaks the truth indeed. What good are we to family and friends if we possess a counterfeit attitude or intention to ourselves or others? Aren't we diluting our true potential if we are less than genuine to ourselves, however unconscious? As my friend Conrad says "bring it all to the table". Hide behind nothing, regret nothing, and let the chips fall where they may. I had Polonius' words tattooed on my inner arm, a place that I look often, so that when I err in intent, waver in my resolve for any reason, I will see its wisdom. My prescription to you for your day tomorrow is to bring it all to the table. Have a coffee, fire up those adrenals and remember : to thine own self be true-always. A book would be fantastic! Photos of your work combined with your insights into the human condition would be a great read. You have a gift of being able to paint a sliver of the human condition in your work. It allows the viewer to explore their own feelings and the ones expressed in the work. You have this ability with the written word as well. Having read all of your posted work here, I would gladly read your book and suggest it to many friends. I have just recently stumbled upon your blog and I must say that I find it to be very thought provoking. You have a gift for writing as well as painting. I think your idea for a book is great, it would be the type of book that I would buy and keep. Thanks Jamieson5 and Corinne. I appreciate your positive feedback and support.